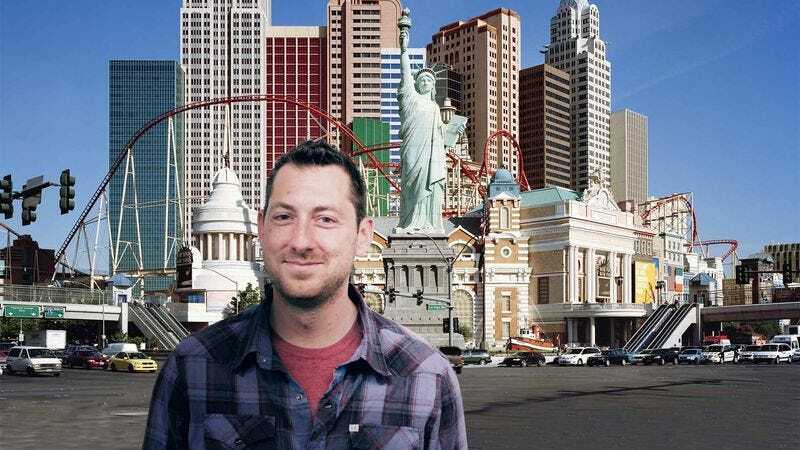 PITTSBURGH—Noting how eagerly he listed off the city’s wide array of live entertainment, dining options, and shopping outlets, sources confirmed Monday that 31-year-old Michael Nelson had somehow reached the conclusion that it was less depressing to go to Las Vegas for something other than gambling. “I don’t want to spend my entire trip sitting inside a casino all day when there’s so much stuff to see and do there,” said Nelson, speaking as if indulging in a 200-dish buffet, touring a celebrity wax museum, or viewing various hotels’ outdoor fountains were not equally tragic reasons to visit the city. “I definitely want to check out that Eiffel Tower they’ve got, and the tiger show, too. One of those hotels even has canals in it just like Italy. I’ve got to see that.” Sources later confirmed that Nelson had apparently duped himself into believing that spending $100 on tickets to see Criss Angel Believe was somehow preferable to losing it at the slots.